Ryan Faint has been working for over 17 years in the plumbing and heating industry. Initially a sole trader, he now has two employees working for him. 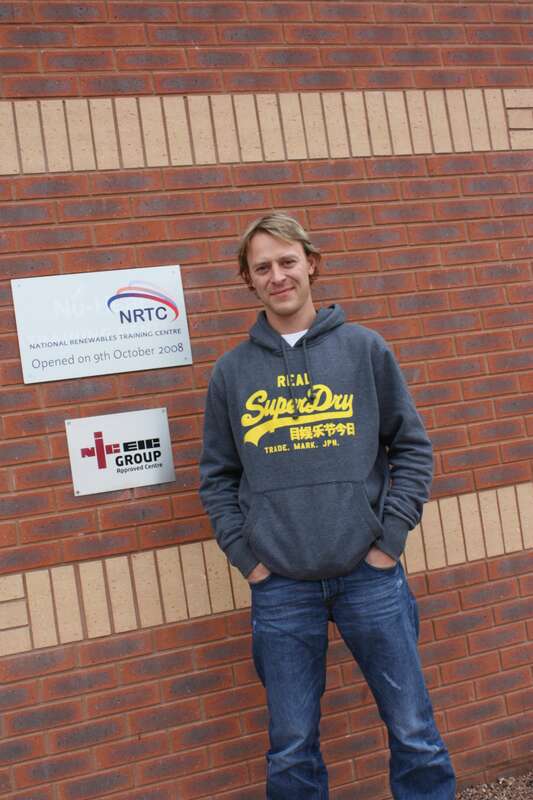 He recently attended Nu-Heat’s National Renewables Training Centre (NRTC) where we caught up with him for a chat about the industry and his reasons for undertaking training. Ryan believes that the general public is becoming more and more aware of renewable heating systems, mainly from coverage on the news and in the media in general. From his experience, anyone who is seriously interested is already astute at researching costs (both for installation and running a system), to see if the option is feasible. Ryan’s first heat pump installation was a massive barn conversion which specified an air source heat pump – primarily to achieve the required level of the Code for Sustainable Homes. Ryan looked around for heat pump and underfloor heating suppliers and decided on Nu-Heat due to the company’s integration skills. He also took the heat pump installation course at the NRTC. The installation caused Ryan to get involved with renewables in more depth, and he has since installed two more heat pumps. Both of these were in refurbishment projects where the decision was taken by the customers who had to choose between oil or a heat pump. Ryan says that customers still need to be educated with regard to the importance of insulation and that new build is definitely a more viable market for renewables at the moment due to the high insulation levels now required. Good design is, of course, paramount, which is where working with a design and supply company is far preferable to buying a heat pump off the shelf. Ryan says that where a heat pump system hasn’t been properly designed, the householder is inclined to blame the heat pump rather than the design. Ryan used to live in a 2-bed Victorian terrace and was not a fan of new houses. He has since moved to a brand new 4-bed townhouse and experienced first-hand the difference in the insulation levels. His heating bills in the new house, which is roughly twice the size of the old one are just about the same. Ryan was attending the training centre for the solar thermal course. The reason behind this is that he has decided to install solar thermal on his own property, with a view to marketing himself as a solar installer – he thinks that by showcasing the product on his house it will be a good advert. Ryan believes that solar thermal should be on every new build. With its lower installation costs, it is garnering quite a lot of interest and of course the results are instantaneous. It is Ryan’s opinion that solar thermal is easier for customers to understand than heat pump technology, although as the public get to hear more about heat pumps this will change. Ryan is interested in installing a heat pump for his house but needs to look further into planning requirements. Nu-Heat has recently begun supplying a single fan Hitachi Yutaki-M air source heat pump which has been granted permitted development (although this must be checked with the relevant local planning authority). Of the training centre, Ryan says that both the heat pump course he took previously and the solar thermal course were very good. ‘There’s a lot to cram in, but the courses teach you to get to grips with what you need to know and apply what you’ve learnt. A renewables installation is a bit like Lego!’ He says that Nu-Heat’s installation documentation is very clear and includes all the calculations needed, making things easier. The plant rooms are designed to be accessible, neat and are in general well laid out. He has also been really pleased by the performance of Nu-Heat’s underfloor heating. Many installers have found the Microgeneration Certification Scheme (MCS) an encumbrance, and Ryan is no exception. He finds the paperwork a real burden and left to his own devices he will stick it at the bottom of the pile! To this end he is joining Nu-Heat’s MCS Support Network, which means that Nu-Heat will look after most of the paperwork so Ryan is free to get on with installing systems. By training in the installation of renewables and gaining MCS accreditation now, Ryan will be ready for an increase in enquiries when the Renewable Heat Incentive kicks in. In fact, he says he’s slightly worried about it starting in case there’s more work than he can cope with!